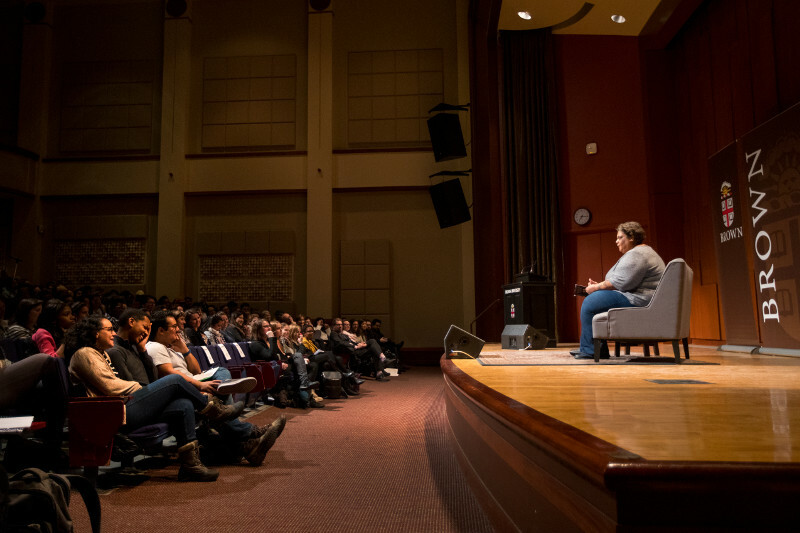 During her visit to Brown on Feb. 14, Gay read short stories and an essay that reveals how political slogans can impact political action. PROVIDENCE, R.I. [Brown University] — In a sharp, funny and wide-ranging reading and discussion at Brown University’s De Ciccio Family Auditorium on Feb. 14, writer, scholar and cultural commentator Roxane Gay discussed the reality television show “The Bachelor,” drew attention to the imprecise language that characterized the presidential campaign and urged the crowd to fight for social and economic justice. Gay, whose visit to Brown was organized by graduate students in the Department of American Studies, read two stories from her collection "Difficult Women" followed by a nonfiction work about waking up on Nov. 9, 2016, and grappling with a new political order. Gay spoke about resisting feel-good phrases that do not reflect facts on the ground. Gay cited the adoption of Michelle Obama’s oft-cited “They go low, we go high,” statement, the use of “nasty woman” by Hillary Clinton supporters as a slogan and “love Trumps hate” as understandable but misguided attempts to find comfort or solidarity. “The phrase ‘loves Trumps hate’ was equally loathsome,” Gay said, “because that is in fact rarely the case and by repeating it over and over, people were literally centering Trump. Language matters because sometimes it becomes an empty container,” for whatever people want to fill it with, she said. Gay argued for the need to “move beyond tidy words that make us feel like the world is a better, more unified place than it actually is,” and for the need to recognize when phrases are used to duck responsibility or dismiss important issues. Still, Gay said, she is often invited to speak at events with the vague mandate to discuss diversity, a word that suffers from “overuse, imprecision, inertia and self-serving intentions,” and is expected to offer solutions for making the world a more inclusive place. 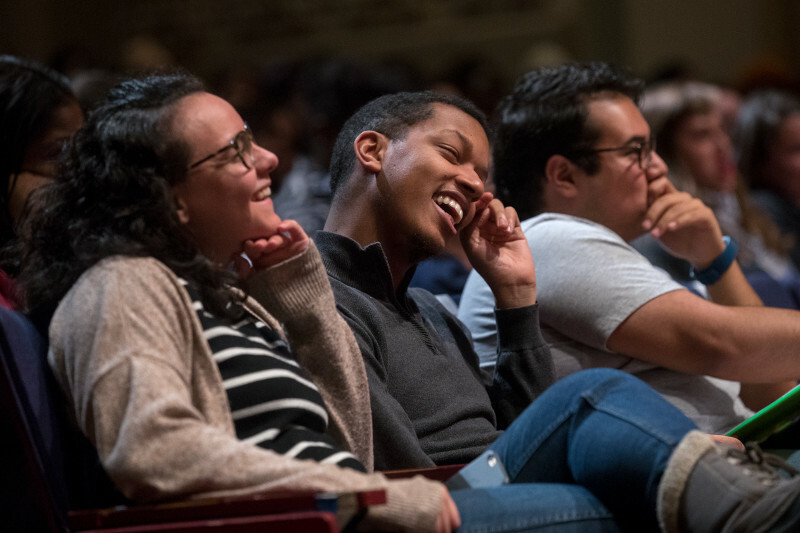 Audience members at Brown appreciated Gay's incisive critiques, which encompassed everything from literature to contemporary politics to pop culture. The antidote to careless, imprecise language and the problems that language seems to perpetuate is change that arises through intent and effort, Gay said, as well as imagination, willingness to think and act differently and a sustained commitment of material resources. While Gay said that the work she does is not so much for herself but for marginalized people who lack her privileges and need someone to stand and speak for them, she said she was not advocating for the comfortable distance the notion of being an “ally” connotes, and she urged others to focus their actions on the challenges marginalized people face. While Gay was asked, during a long question and answer session, for advice on everything from how to understand different claims of and about feminism by celebrities, what kind of art or writing might be prioritized in tumultuous political times, how to help young students whose identities might be under attack and why a certain contestant is still on “The Bachelor” (the producers’ plant, Gay opined), Gay asserted that she does not know what is coming next and is thinking hard about how to find a way forward.